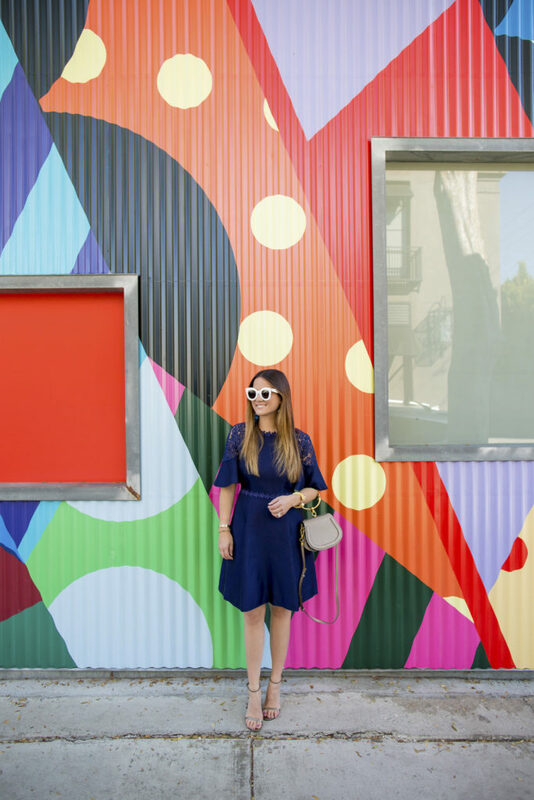 The Chicago-based blogger recently added the Draper James Solid Maggie Dress to her wardrobe, and we’re just loving how she put together her entire outfit. Tell us how you chose to style this dress. Navy is totally the new neutral, and I wanted to accentuate the tone with some fun statement fringe earrings. The ombré style brought out the color of the dress, and simple strappy sandals always give the illusion of more height (which I love!). The dress is really the showstopper, so selecting simple accessories was key. What drew you to the Solid Maggie Dress? The Solid Maggie Dress is positively beautiful! 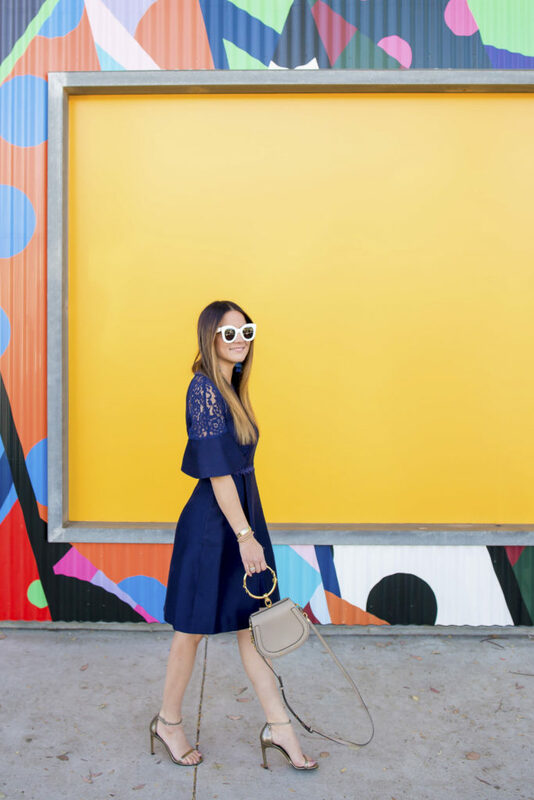 Beyond the luxe fabric and navy blue hue, I fell head over stiletto heels in love with the lace sleeve detail. Plus, I truly believe that fit and flare dresses are incredibly flattering for all body times; it’s my go-to silhouette for dresses. 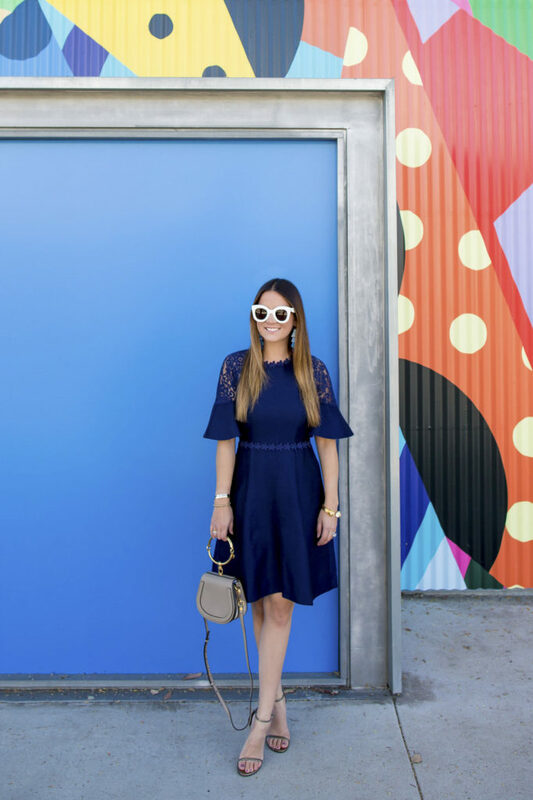 This is seriously the perfect “365 dress,” a style you can wear every day of the year. This winter, I’ll style it with opaque tights and chic cardigan; in spring I’ll pair it with a pink bag and accessories; in summer I’ll pair it with espadrilles and a bamboo bag. I also love how versatile it is for work and weekend. It’s also a wonderful dress to pack for vacations and trips. The fabric is so luxe and sturdy that it doesn’t require a lot of ironing or steaming. How would you style this dress for the chiller months? 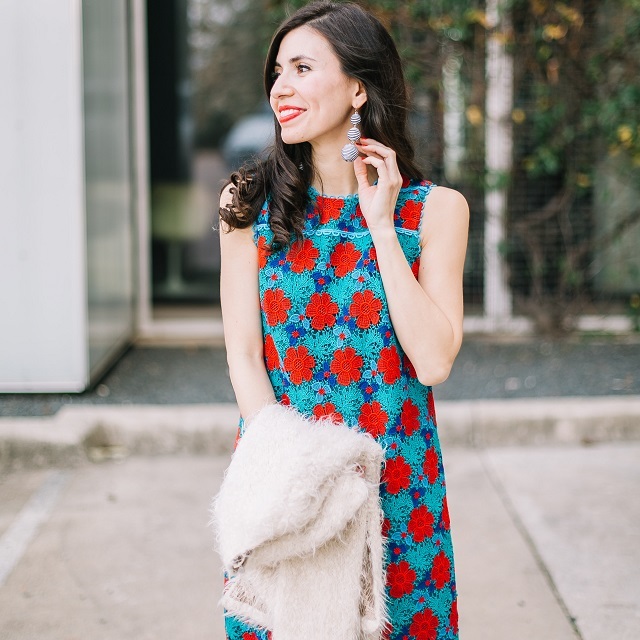 There are so many amazing ways to style this dress for winter. One idea is pairing it with over-the-knee suede boots and a white button down shirt underneath. Another option is a navy blue turtleneck, opaque tights and heels. I also love the concept of wearing a vest over it with a chic belt. For evening, I’d add a sparkly navy blazer and pumps. 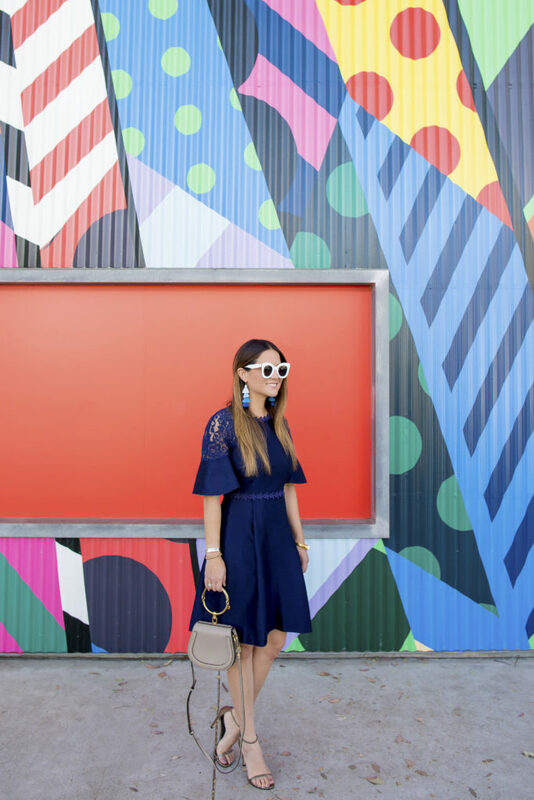 What’s your favorite fall dress trend you’re seeing right now? I’m really loving the darker jewel tone trend –think plums, burgundy, and deep reds. Beyond dresses, the hue is prevalent in handbags and most accessories. Draper James nails it on the head with the Rosslyn Dress–so elegant and timeless! Shop the Solid Maggie Dress here.